Contrary to somewhat popular belief, buttermilk does not contain butter, and it is not the higher-fat counterpart to milk. Originally buttermilk was the excess liquid that is left over after butter is churned, hence the term "buttermilk," or the milk that comes from butter. 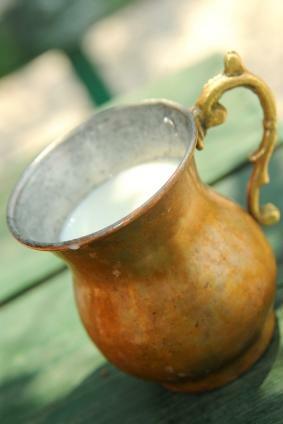 Old-fashioned buttermilk is collected from the leftover liquid after butter is churned by hand. It is simply poured off the top and squeezed out of the butter. However, the cultured buttermilk you buy in the store is made by introducing lactic acid bacteria into milk. Typically, the milk is either skim or no-fat. Once the culture has been introduced, the buttermilk is left to ferment for about 12 to 14 hours at a temperature of about 68-70 degrees F. You will mostly see salted buttermilk, although sometimes you can find unsalted buttermilk as well. Believe it or not, you can make buttermilk at home. It is easy to do, albeit a little time consuming. However, the advantages are that you never have to buy it in the store again if you don't want, and you know exactly what went into making it. Buttermilk is the excess liquid that comes from churning butter, so making homemade buttermilk is as simple as making homemade butter. Pour cream into a stand mixer fitted with the whisk attachment. Beat the cream on medium until soft peaks form; approximately 10 minutes. 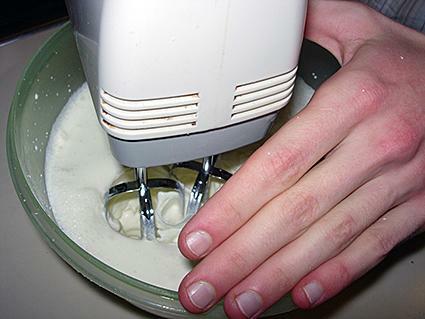 If the cream isn't forming soft peaks, increase the speed on your mixer. Once soft peaks form, turn your mixer up on high and continue whisking until the cream is solid and there is excess liquid in the mix. Once you've reached this point, take your butter/buttermilk and pour it through a fine sieve, collecting the liquid in wide-mouthed container. It is okay if there are speckles of butter in the liquid. By hand, squeeze the excess buttermilk from the butter and drain into the wide-mouthed container. Strain again. You can store this kind of buttermilk in the fridge for up to a week. You can also store the butter for about a week. You can make buttermilk just like you find in the store. For this recipe, you have to start with some buttermilk; however, the advantage is that you will never have to run out of buttermilk again if you regularly reculture your mixture. Pour cultured buttermilk into the clean jar. Top off with plain milk. You can use any type of milk (low-fat, whole, etc.). Place the jar in a warm spot, out of direct sunlight, and let it sit out for 12 to 24 hours until it is thick. Once it's thick, you can store it in the refrigerator for up to two weeks. If you want to keep a never-ending supply of buttermilk, don't use that last quarter cup of buttermilk! You can also culture your own buttermilk from scratch, rather than starting with store-bought buttermilk. You need to start with raw milk. You might be able to buy this from a farm - generally, raw milk is not sold in stores because milk in stores has to be homogenized. One quart-sized container with a lid. Leave out one cup of raw milk in a covered container until it looks like thickened yogurt, until it's clabbered. This usually will take at least a few days. Take out a quarter cup of this mixture, and repeat the process of putting it in a pint jar, adding more fresh milk, shaking vigorously and then letting it sit out until it is like thickened yogurt. Continue to do this until your mixture reliably thickens in 24 hours. If you taste it, it should be tart but not bitter. This is your buttermilk culture. To make one quart of buttermilk, add six ounces of this mixture to a quart jar and top off with fresh milk. Let the mixture sit out until it is thick and creamy -resembling buttermilk. Use 1 cup plain yogurt in lieu of 1 cup buttermilk. If plain yogurt is too thick for your recipe, use 3/4 cup yogurt plus 1/4 cup milk to replace 1 cup of buttermilk. Add 1 tablespoon of vinegar or lemon juice to 1 cup of regular milk. Let stand for 10 minutes. Use this in lieu of 1 cup buttermilk. Add 1 3/4 teaspoons of cream of tartar to 1 cup milk. Mix thoroughly and use instead of 1 cup of buttermilk. You can use whole milk in lieu of buttermilk in recipes. It will change the taste slightly, and if the recipe is leavened, you will need to adjust the amount of baking soda and baking powder called for to get the right texture and product. If you want that slightly tart taste that comes from buttermilk, mix sour cream with milk until it comes out to the desired consistency you need for a recipe. Less fat content than milk, flavorful and refreshing when chilled, buttermilk is a main staple in many family's refrigerators. In addition, it is called for in many southern food recipes such as pancakes, fried chicken and biscuits. It is so easy to make at home, you never have to buy it in the store. Pull out those recipes that call for buttermilk and start cooking.